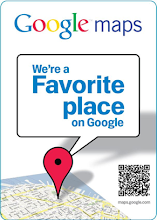 Florist Wilmington NC | Bloomers Flowers Blog - Wilmington NC | BloomersBlog: Art Nouv-OH! I've always loved jewelry. Gold, silver, precious or costume, I love it all. 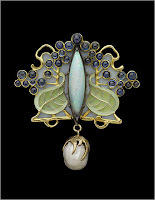 Recently, the Boston Museum of Art launched a beautiful exhibit of Art Nouveau and Art Deco jewelry, popularized at the turn of the last century. Oooooo! And wouldn't you know it...many of the pieces include flowers in their design! 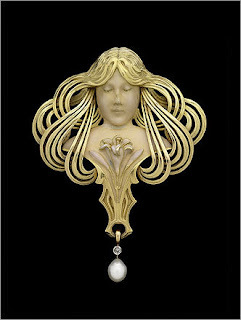 Rene Lalique was the most renowned of the Art Nouveau artists. 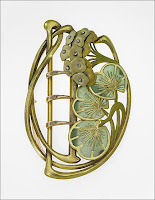 His large pieces were often made of unusual material such as horn, enamel and glass. He was especially known for his technique called plique a jour enameling, which means "open to light". This gave his pieces a lightness not previously seen. 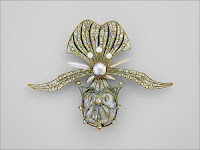 Other renowned designers, such as Georges Fouquet, preferred gold and semi-precious stones. He later joined forces with a master enameler, who would sometimes etch the surface of the enamel with acid, creating a shimmering effect. One of my favorite pieces of jewelry is a beautiful art deco necklace purchased in Prague a few years ago. It's a striking design executed in sterling, centered with a moonstone, and it never fails to elicit compliments whenever I wear it. Hi Debra - I love your blog although I have finally been able to get on it. I know you were willing to show me how easy. I love the Lalique pieces. Are you the owner of the orchid one. You know we are into orchids. Have a gorgeous oncidium in bloom right now. I love your stories, too. Have been to Belgium (my husband's sister lives in Breda The Netherlands). The "carpet" must be gorgeous.